Mobile technology appears to be increasing the public appetite for news but it's far from clear whether the news industry will profit from that, a study issued Monday concluded. NEW YORK (AP) — Mobile technology appears to be increasing the public appetite for news but it's far from clear whether the news industry will profit from that, a study issued Monday concluded. The Pew Research Center's Project for Excellence in Journalism, in its annual state of the news media report, found encouraging signs within the 27 percent of Americans who say they get news on their smartphones or tablets. These consumers are likely to seek out traditional news sites or applications, strengthening their bond with old newspaper or television news organizations. 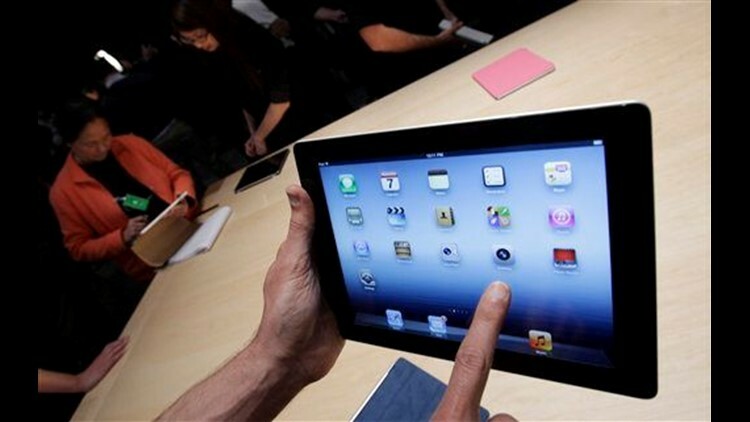 People with tablets tend to read longer articles and spend more time with news sites than they do on phones or desktop computers, said Tom Rosenstiel, Project for Excellence in Journalism director. Many people already make it a habit to check their tablets before going to bed to see what is going to be in a newspaper the next day, he said. Unique visits to online news sites jumped 17 percent from 2010 to 2011, similar to the increase from the year before, the report said. "The demand for conventional journalism endures and in some ways is even growing," Rosenstiel said. "There were many people that didn't predict that. The content is still coming from traditional news companies." Yet technology companies, rather than news companies, are better set up to take advantage of online revenue opportunities. The report found that five companies — Microsoft, Google, Facebook, AOL and Yahoo! — generated 68 percent of digital ad revenue in 2011. News companies are generally not as able to provide the specific consumer information that digital advertisers seek, and they certainly have not been as aggressive in this area as the technology companies, said media critic Jeff Jarvis, who writes the Buzzmachine.com blog. Jarvis also criticizes news organizations for not being more creative with their websites and applications, and not encouraging users to link information. "I fear the iPad is a siren call to news organizations, seducing them into thinking they can maintain their old models and old controls, not just maintain but regain them," he said. For news organizations, "there's a lot of work that needs to be done," said Roger Fidler, program director at the Donald W. Reynolds Journalism Institute at the University of Missouri. "But it needs to be done very quickly." Rosenstiel noted the trend of technology companies working with news organizations on new ventures announced within the past year: Yahoo! reaching a deal to stream ABC News reports; YouTube launching original programming channels, including one operated by the news service Thomson Reuters; The Washington Post developing a news aggregator, Trove.com, available through Facebook. The Associated Press has begun providing some of its election coverage to the popular tablet app Flipboard, entered into a partnership with WhoSay.com over use of celebrity photos and also worked with Twitter on release of Nevada Republican caucus results. The PEJ report noted how social media is increasingly driving news, through people who pass along recommendations to read articles to their friends through Facebook and Twitter. Still, only 9 percent of adults say they follow such recommendations regularly, compared to 36 percent who say they go directly to a news organization's app. Most media sectors saw audience growth in 2011, with the exception of newspapers, the report said. The television network news audience grew for the first time in a decade and local stations also saw news growth in the late evening and early morning, the PEJ said.